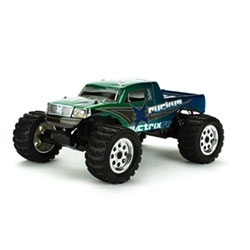 The Ruckus® Monster Truck is a true ready-to-run vehicle that comes with absolutely everything included in one box. You read that right, everything’s included—right down to the AAs. The 2.4GHz radio system provides extended range and interference-free operation, while the waterproof electronics keep you running, no matter what Mother Nature throws your way. A Dynamite® 1800mAh Ni-MH battery and 2.0A peak charger are included and come pre-wired with high-current EC3™ connectors. We designed the Ruckus to be reminiscent of a real world-scale monster truck without looking too cartoonish. The vehicle comes with absolutely everything you need to get started. All you need to do is charge the battery and let it rip. The Ruckus will tear through the neighborhood or backyard with ease, and because of its bulletproof chassis and extremely durable powertrain, maintenance is kept to a minimum. The 15T Dynamite motor gets the truck quickly up to speed, and thanks to the waterproof electronics and receiver, the vehicle can easily handle anything Mother Nature throws its way.